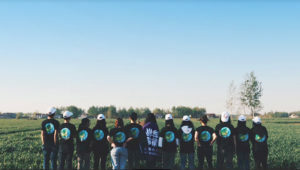 Three NYU Shanghai students have won the National Championship for China in the Unilever Future Leaders’ League (FLL), a business case competition that challenges university students to work with business leaders to come up with innovative marketing and branding solutions for Unilever brands. The team of Echo Ma ’19, Lyndsy Qu ’19, and Leanne Li ’21 bested six other groups chosen from more than 2,100 participants across 300 universities. On April 8, Ma, Qu, and Li will represent China in the Global FFL Final in London, competing against 29 other teams from around the world. Global championship team members will be invited to join the Unilever Leadership Internship Program. Previous years’ winners have also been fast-tracked into the company as management trainees. Marketing majors Qu and Li met finance major Ma through the 4-credit course, “Branding and Innovation,” co-taught by Assistant Arts Professor Christian Grewell, and Assistant Dean of Business and Clinical Assistant Professor of Business Raymond Ro. Qu, who is involved in Student Life and the Commencement Committee, naturally took on a leadership role in the team. Li, who has studied art, piano, and dance, was the team’s ‘creative.’ Ma leveraged her finance knowledge for cost and budgeting calculations. In the lead-up to crucial presentations, the team would meet every evening after class. A screenshot of the team’s presentation on successful online campaigns by Kiehl’s and Pechoin. For one of the challenges, the team designed a marketing campaign to make a dated skincare brand accessible to Generation Z consumers. First, the team analyzed consumer behaviors and isolated their pain points. Then, they researched successful online campaigns involving Key Opinion Leaders and short video sharing platforms like TikTok. The resulting 20-page presentation included a strategy for improving the brand’s market penetration while increasing the loyalty of existing customers. Three teams from NYU Shanghai, iSkin, Timeless and Super Rise, have also made it to the China National Final for the L’Oreal Brandstorm competition this year. The competition will take place on April 2, and the teams will compete with nine other teams across China for two spots in the global final in Paris. Fish and birds are able to move in groups, without separating or colliding, due to a newly discovered dynamic: the followers interact with the wake left behind by the leaders. The findings, by a team of researchers including NYU Shanghai Professor of Physics and Mathematics Jun Zhang, offer new insights into animal locomotion and point to potential ways to harness energy from natural resources, such as rivers or wind. More broadly, the study opens possibilities for better capturing natural resources to generate energy from wind and water. “While we currently use wind and water to help meet our energy needs, our work offers new ways to more efficiently leverage them as we seek new methods for enhancing sustainable practices,” observes Leif Ristroph, one of the paper’s co-authors and an assistant professor in NYU’s Courant Institute of Mathematical Sciences. It’s well known that animals such as fish and birds often travel in groups, but the details of these interactions in schools and flocks are not fully understood. In order to study the effects of flapping motions and flow interactions on the movement of members in a group, the researchers conducted a series of experiments in the Courant Institute’s Applied Math Lab. Here, they designed a robotic “school” of two hydrofoils, which simulate wings and fins, that flap up and down and swim forward. The flapping motion of each foil was driven by a motor, while the forward swimming motions were free and result from the pressure of the water on the foils as they flap. The researchers varied the speed of the flapping motions to represent faster and slower swimmers and fliers. The process may be viewed here. (credit: video courtesy of Joel Newbolt, NYU’s Courant Institute of Mathematical Sciences). Their results showed that a pair of foils with different flapping motions, which would swim or fly at different speeds when alone, can, in fact, move together without separating or colliding due to the interaction of the follower with the wake left behind by the leader. Specifically, the follower “surfs” in distinct ways on the wake left by the leader. If trailing behind, the follower experiences a “push” forward by this wake; if moving too fast, however, a follower is “repelled” by the leader’s wake. “These mechanisms create a few ‘sweet spots’ for a follower when sitting behind a leader,” observes Zhang. Read additional coverage of the research by PBS/NOVA here. 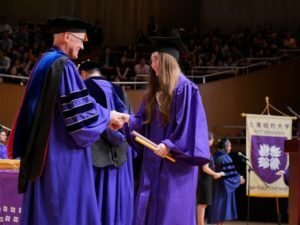 Applications to NYU Shanghai jumped 25 percent this year, bringing the total number of applicants for the 450 spots in Fall 2019’s freshman class to 16,750. Students who listed NYU Shanghai as their first choice among the three campuses of the NYU Global Network (New York, Abu Dhabi, and Shanghai) also rose dramatically – by 43% this year. This is the fourth year in a row that application numbers have grown, indicating the university’s growing popularity among high school seniors worldwide. 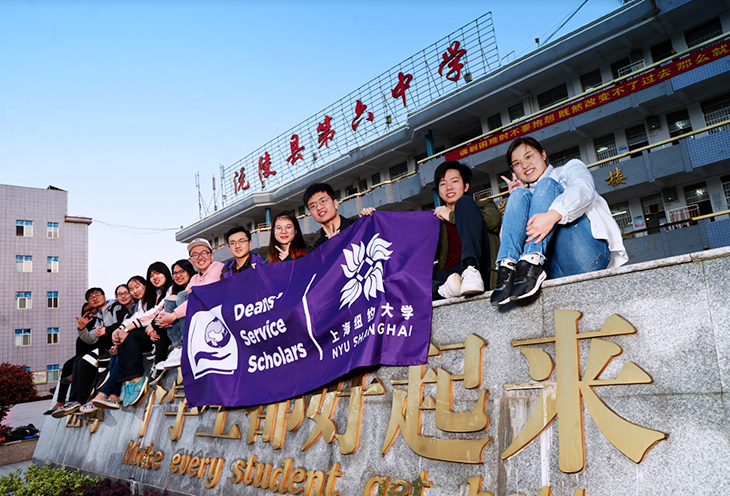 The NYU Shanghai Admissions office reports that the applicant pool remains extremely diverse – with students from across six continents and 149 countries applying for admission. Not surprisingly, students from the United States and China represent the majority of applicants. Chinese applicants to NYU Shanghai also remarkably grew by nearly 45 percent to just under 3,000. And, for the first time, the NYU Shanghai applicant pool includes students from all 34 provinces and regions. Overall, NYU received a record-shattering 84,481 applications for admission this fall, an increase of 12% from last year. 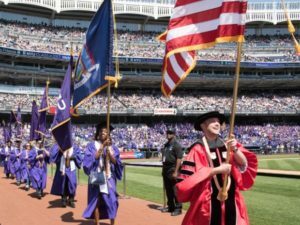 This is the 12th year in a row that applications to NYU have risen, with the total number doubling during the same period. This post comes to us from NYU Shanghai; the original can be found here. Pilkyung Moon, an assistant professor of physics and a member of the NYU-ECNU Institute of Physics at NYU Shanghai, working in collaboration with a research group from Sungkyunkwan University, have succeeded in creating a new kind of quasicrystal. In research featured on the cover of Science, Moon and his colleagues reported that a new kind of quasicrystal can be designed by the overlay of two periodic layers at a specific configuration. Solid-state materials are composed of atoms. For a long time, it had been believed that periodicity is essential to arrange atoms in an ordered fashion, and such arrangement was named a crystal. In a two-dimensional space, for example, only a few arrangement patterns, i.e., triangular, rectangular, or hexagonal arrangement, can tile space without vacancy in a periodic manner. In 1970s and ’80s, however, researchers discovered very rare patterns which can tile space in an ordered but not periodic fashion. Such novel arrangement was newly named a quasicrystal, and has greatly expanded our understanding of the atomic order. However, quasicrystals are quite rare in nature. Professor Joung Real Ahn’s group in Sungkyunkwan University developed an innovative idea to grow two hexagonal (graphene) layers at exactly 30°, and measured various physical properties. Professor Moon’s theoretical calculation proved that the scattering pattern observed in the experiment can appear only at exactly 30°, and even a slight deviation of the angle (e.g., 29.958°) cannot reproduce the observed pattern. This result provides solid evidence of the fact that the research team’s system is at quasicrystalline configuration. In addition, the theoretical investigation also revealed many exotic features of quasicrystals such as the emergence of infinitely many Dirac cone replicas as well as the unusually strong scattering. The discovery of this new kind of designer quasicrystal will expand knowledge about atomic order by enabling the systematic studies on the structures lying between periodic systems and non-periodic systems. Research findings in this study will enable scientists to build a theoretical model that can describe the physical properties of this novel structure without relying on the approximations used in the conventional quasicrystal research. This post comes to us from NYU Shanghai. You can read the original here. More than two billion tons of solid waste is generated every year by the world’s cities — a challenge that if left unaddressed, will continue to have serious health, safety and environmental consequences. This semester, nine IMA students accepted the challenge of “learning everything about plastic and plastic pollution” and finding ways to sustainably upcycle it in a new course, Re-Made in China. “Our goal is to become as knowledgeable as possible about our subject, and to come up with viable project ideas and prototypes that can be sustainable and fair business models generating a positive social impact for local communities,” says Clinical Instructor of Arts Marcela Godoy. The two-credit course, guided by the principles of sustainable design philosophy, will introduce students to both traditional and new technologies to address social and environmental problems. The goal is to remake plastic waste into “something valuable and even extraordinary,” be it accessories, handcrafts or an art project. In class, students are divided into 3 groups: one focusing on developing machines to process plastic, such as shredding and melting; another experimenting with what materials plastic can be transformed into; and the third on designing new products. “I want students to work together like a design firm, where we learn about plastic together and collaborate on projects,” Godoy says. Godoy’s idea of recycling emerged in 2012, when she was working in New York at YesYesNo, a studio for interactive arts and technology projects. She noticed the huge amount of waste generated from projects, and decided to upcycle the materials to make necklaces and other accessories. “How ironic that things to make people feel beautiful can be made out of the opposite,” she says. 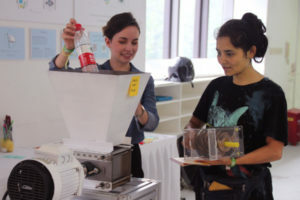 Marcela Godoy on the right, showing a student how to use the plastic shredder that she built. 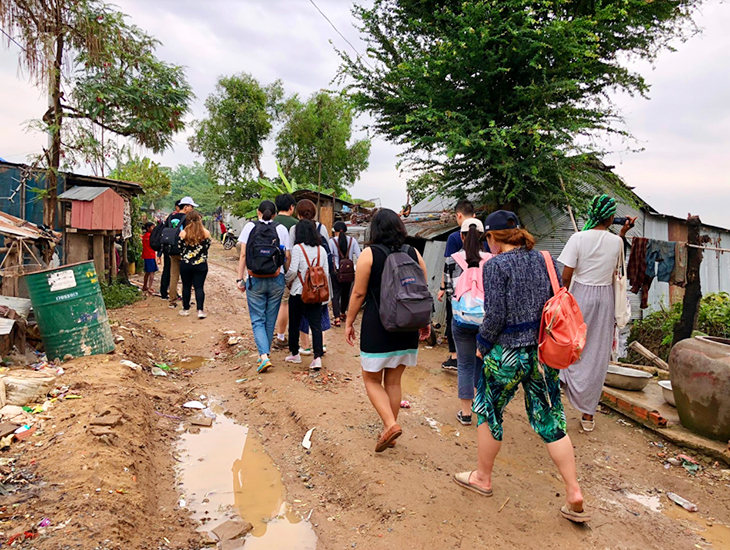 Godoy is encouraging her students to become even more deeply engaged with the community they live in, by assigning projects that take them out of the classroom, such as creating “trash maps” tracking plastic trash routes through Shanghai. Godoy also plans to invite seasoned designers from Precious Plastic Shanghai,a social enterprise devoted to raising plastic pollution awareness in China, to offer hands-on coaching to students in a workshop later in November. Godoy worked with the team after moving to China in 2015. At the end of the course, Godoy plans to launch a “Re-Maker Space” for the benefit of the whole NYU Shanghai community, where all students and faculty can drop by to process plastic and make something valuable of their own. The seven-week course is expected to conclude on December 11. Following the end of the semester, Godoy will present her class’ work at the Precious Plastic WANA Conference in Abu Dhabi on December 16-17. This post comes to us from NYU Shanghai and the original can be found here. 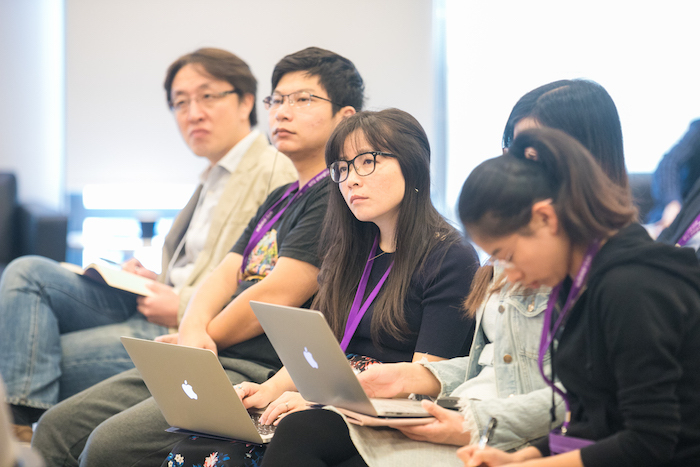 This week, scholars from around the world gathered on campus to discuss and present new research at NYU Shanghai’s first-ever workshop on Holocaust studies. Co-hosted by the United States Holocaust Memorial Museum(USHMM), the Shanghai Jewish Refugees Museum (SJRM), and NYU Shanghai, the workshop focused on the role the city and people of Shanghai played in harboring Jewish refugees during World War II and the lasting legacy of that act of generosity. The five-day workshop showcased more than a dozen research projects, ranging from literary narration and memorialization of the Holocaust to the impact of gender in German literature of the Holocaust. 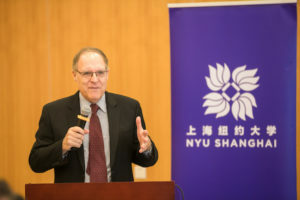 Leading historians such as NYU Professor of History David Engel and Chen Jian, director and curator of the Shanghai Jewish Refugees Museum, presented, led, and participated in discussions throughout the week. Waley-Cohen said the workshop not only presented junior academics with an important opportunity to share new, original, and unpublished research, it also introduced participants to the Holocaust Museum’s rich and underutilized archival materials. In his remarks, Chen spoke of how SJRM is devoted to commemorating Shanghai’s historic role in sheltering Jewish refugees in the 1930s and 1940s, and to ensuring that Shanghai’s experience becomes part of a global conversation. “The relevance of the Holocaust to China’s history and culture lies in the fact that, during a time of need, China was able to provide emotional and tangible support to Jewish refugees who looked to settle down here,” Chen said. 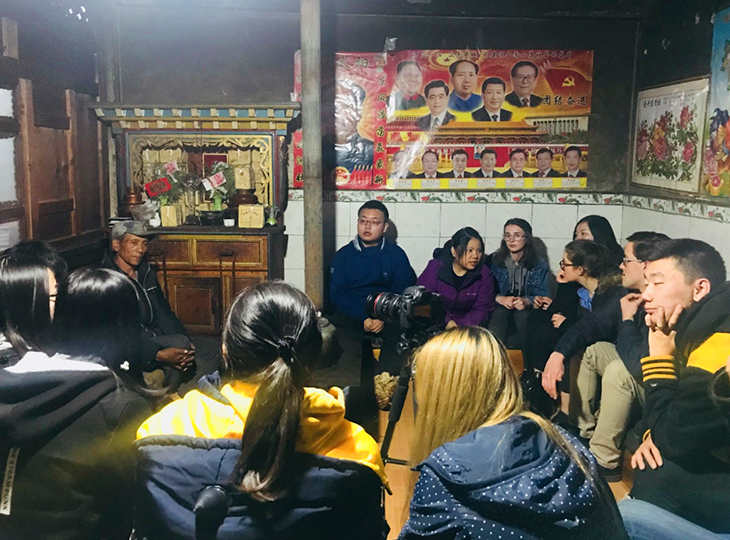 Yong-jian Zhao, a lecturer of history at Zhejiang Gongshang University, recalled the lives of “Jewish friends of China” such as Israel Epstein and Sydney Shapiro who were among 20,000 Jewish refugees who found a safe haven in Shanghai during the war. Unlike their fellow refugees, Epstein and Shapiro chose to remain in China after the war, embracing the goals of the Chinese Communist Revolution. “I want to explore the origins of this group, to identify reasons for China’s appeal to Epstein and Shapiro and to other Jews like them, and to explore how they, looking back after years of living in China, assessed their own lives and their Jewishness,” Zhao said. During the week, workshop participants visited the Shanghai Jewish Refugees Museum in Hongkou district, where they were introduced to the research tools and resources available at both the SHRM and the USHMM. In his presentation on Monday, Engel, the Maurice R. and Corinne P. Greenberg Chair of Holocaust Studies and Professor and Chair of Hebrew and Judaic Studies at NYU, made a forceful argument for why Holocaust studies should be relevant to people of all backgrounds and nationalities. He addressed questions that some Americans have been asking for decades: Why did the US government spend millions of dollars on building a museum that chronicles the history of an event that did not happen in their homeland? By considering the events of the Holocaust as a human being as opposed to a member of a country that had little to do with the horrors of World War II, the event becomes a lot more relevant to each of us, he said. The workshop concluded on 19 October. NYU Shanghai Professor of Computer Science Zhang Zheng has been appointed Director of Amazon Web Services’ (AWS) newly-opened Shanghai Artificial Intelligence Lab, where he will lead the company’s advanced research and development of deep learning. AWS made the announcement on September 17 at the 2018 World Artificial Intelligence Conference in Shanghai, shortly after Zhang, a U.S. citizen, became the first foreigner to receive a work permit from the Pudong government allowing him to hold simultaneous positions at Amazon and NYU Shanghai. An award-winning expert in the theories and practices of large-scale distributed computing and its intersection with machine learning, Zhang held significant positions at Microsoft and Hewlett Packard prior to beginning his career at NYU Shanghai in 2013. At Amazon, Zhang, who will maintain his appointment at NYU Shanghai but take a leave of absence from his university duties, plans to build a lab that researches natural language processing with a special focus on Chinese. He also hopes to engage and develop an open-source deep learning ecosystem and advise Chinese customers on machine learning and AI adoption. “I’m honored to join the AWS AI Lab Shanghai, where, together with some of the world’s brightest minds, we will have the opportunity to spur innovation, make technologies easy, fast, and useful for Chinese organization of all sizes,” Zhang said. “One of the areas I will emphasize is fundamental research via a lab with global culture, and do so in tight collaboration with major universities in Shanghai, including NYU Shanghai,” he added. Earlier this month, the Exit-Entry Administration of the Pudong Public Security Bureau, as part of its efforts to attract high-end foreign talent, issued Zhang its first-ever work permit allowing foreigners to work part-time in the Shanghai Free Trade Zone. 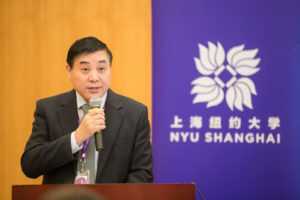 NYU Shanghai Chancellor Yu Lizhong applauded the new policy. 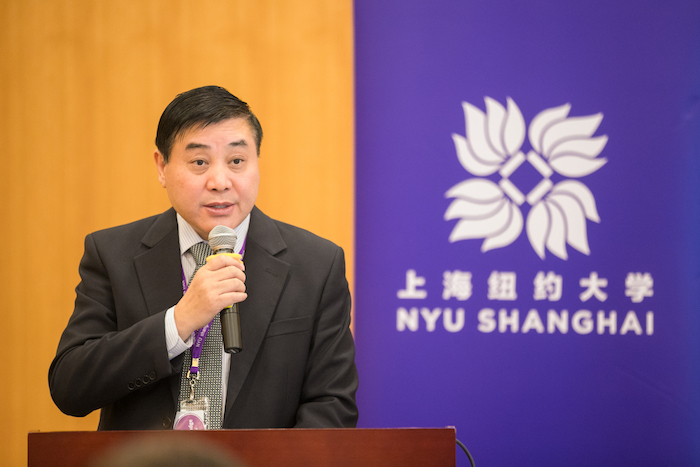 Professor Zhang is not the first NYU Shanghai community member to take advantage of the government’s efforts to clear hurdles and enable more foreign citizens, particularly innovators and entrepreneurs, to work in Shanghai. Last June, Tyler Rhorick ‘17 became the first international student to obtain a work permit under a new policy allowing foreign graduates of Chinese-accredited universities such as NYU Shanghai to obtain visas to work in Shanghai’s Free Trade Zone. Rhorick now works in NYU Shanghai’s Student Life Office. Another alumna, Lathika Chandra Mouli ‘17, an Electrical Engineering major, obtained a new “Talent Visa” from the Shanghai Yangpu district that is reserved for recent college graduates employed by startups or Fortune 500 companies. Mouli joined Energo Labs, a blockchain startup, as a project specialist after graduation. This post comes to us from NYU Shanghai. The original can be found here. 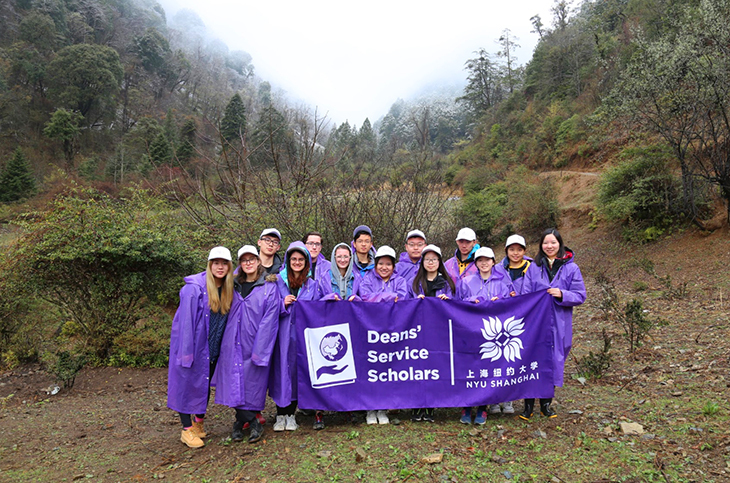 The 2017-2018 Deans Service Scholars program is open to all NYU Shanghai students and allows selected scholars the opportunity to learn about community development and service through a progressive learning experience. 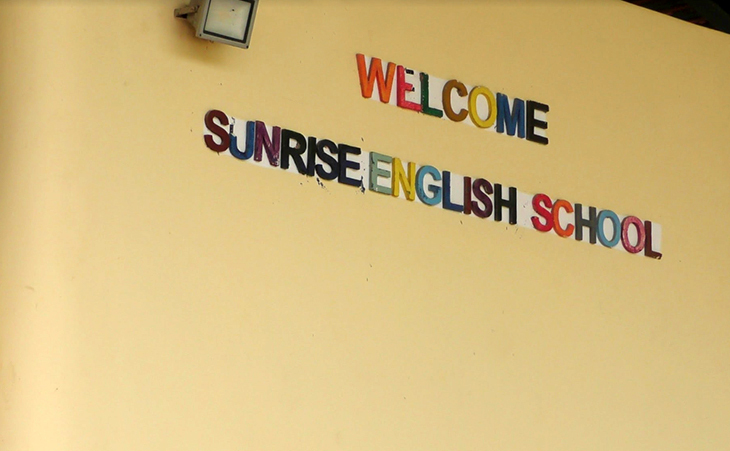 This experience includes classroom interaction, direct service, and travel. 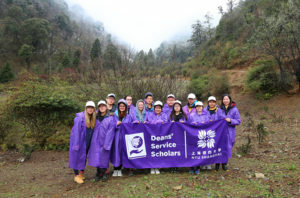 Our DSS Group had a memorable experience in Anhui with our visits to an orphanage, home visits to HIV-affected families, visit to a village affected by HIV, and interacting with the Chi Heng students. As part of Qing Ming Festival, we held a kite decorating activity where we asked HIV-affected children to draw their hopes and dreams for the future. Some shared dreams about becoming a music star, others dreamed for world peace and good health. We then flew our kites and watched as we flew our dreams to the sky. The DSS scholars on a visit to a local community in Cambodia. NYU Shanghai students taught at Sunrise English school for two days. Students planted trees to provide food for the endangered snub-nosed monkey. 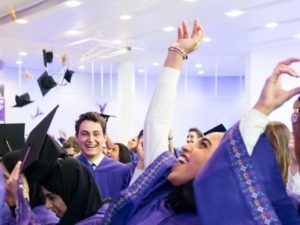 It is the time for celebrating graduating students across NYU’s global network. The All-University Commencement Exercises will take place on Wednesday, May 16 at Yankee Stadium in New York. NYU Abu Dhabi’s 5th Commencement ceremony will be held on Sunday, May 20 at its campus on Saadiyat Island. NYU Shanghai’s second Commencement ceremony will take place on Wednesday, May 23 at the Shanghai Oriental Art Center. 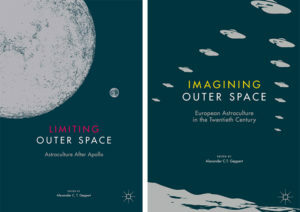 Professor Alexander Geppert, a leading historian of Europe, has recently been named the Charles A. Lindbergh Chair in Aerospace History at the Smithsonian National Air and Space Museum in Washington DC for the year 2019–20, a distinguished award that will facilitate his research on the history of outer space and twentieth-century astroculture. Named after the legendary American aviator Charles A. Lindbergh (1902–74), the Chair offers senior scholars with prominent publication records a competitive 12-month fellowship that encourages their book projects in aerospace history, supported by a maximum of US$100,000 towards living expenses. Alexander Geppert is the first European and third non-US citizen to win the prestigious award since its inauguration in 1978. For the year 2019–20, while immersed at the Smithsonian National Air and Space Museum, he will be working on a new book project that analyzes global perspectives on outer space. Shortly after the announcement, The NYU Shanghai Gazette talked to Professor Geppert about the impact the award will have on his current research and The Global Space Age, one of the courses he will teach at NYU Shanghai in the upcoming fall semester before heading to Washington DC next year. What does this award mean to you on both an academic and personal level? With more than 7 million visitors per year, the Smithsonian National Air and Space Museum in Washington, DC is one of the most visited museums in the world. What fewer people know is that it is also a fantastic research institution that comprises three departments: Aeronautics, Earth and Planetary Sciences, and Space History, which will be my “home” there. Its circa 30 curators are not only responsible for organizing top-notch exhibitions but are also deeply engaged in historical research and, in fact, among the world’s leading experts in their fields. I spent an extremely productive year there in 2014–15 before joining NYU, and I am much looking forward to returning to such a stimulating environment five years later. The Lindbergh Chair is the most advanced fellowship they offer. I am truly excited to take it on, as I love that place as much as I love my research–even if I will certainly miss colleagues, students and friends in Shanghai, New York and Berlin. Can you describe what your research plans are during your fellowship year at Smithsonian National Air and Space Museum? By the time I arrive in DC, I hope to have finished the book that I am currently working on, The Future in the Stars: Time and Transcendence in the European Space Age, 1942–1972, and I plan to start with my next project during that year. Tentatively entitled Planetizing Earth: Outer Space and the Making of a Global Age, 1972–1990, it will take the study of outer space to a global level. Most historical scholarship has focused on the first spacefaring nations, the former USSR, the USA and, to a lesser extent, Europe. But what explains the appeal of astroculture in places such as Congo, China, Egypt, French Guiana and Sri Lanka? At the same time I will be investigating a historical process that I call “planetization,” a term I borrow from French philosopher Pierre Teilhard de Chardin. In particular after the end of the “classical” Space Age in the early 1970s, outer space has become a technological precondition of present-day globalism—just think of all the communication satellites and invisible infrastructures on which we all depend so much in our globally interconnected lives. What do you hope students will gain from your upcoming course “The Global Space Age”? How might they understand space exploration or competition in a current context? I hope that students will learn that outer space has its own history, and that examining this history is necessary to understand what is going on both here on earth and “out there.” While outer space, extraterrestrial life, and global astroculture might at first seem obscure and peripheral, if not entirely exotic topics, we will consider the central role space and spaceflight have played over the course of the twentieth century, both in science and in fiction, and in particular, seen in the second so-called Space Race in Asia of today. We will cover a broad range of themes, from science fiction, literature and alleged UFO encounters to the history of science, technopolitics and warfare. We will also watch historical space movies, visit Shanghai Jiao Tong University’s Qián Xúesēn Museum and meet with experts from the Chinese Academy of Sciences. All my classes are very work- and reading-intense, but I also make sure that we have a lot of fun—serious fun! This post comes to us from NYU Shanghai, you can find the original here. Designed by the Digital Communications Group.